I’m re-reading Victor Hugo’s Les Misérables after 20 years. Start with part 1, go back to the chase through Paris, or read on. Frustrating to a modern reader, Hugo tends to separate exposition and action. He’ll describe the characters and setting in exquisite detail for pages on pages, then tell you what they did there. In this case, it’s the convent where Valjean and Cosette have landed, and its order of nuns. They practice severe isolation even when visitors are allowed, only speaking through a small grille in the wall of the parlor. The nuns are forbidden to bathe or brush their teeth. “The act of brushing the teeth is the topmost rung of a ladder of which the lowest rung is perdition.” Maybe it’s just as well that they’re so isolated. One of the strange sights – the shrouded body with a rope around its neck – turns out to be an atonement ritual practiced by the nuns. The fact that they cannot inter their dead within the convent grounds is mentioned in passing, though it’ll be important later. The convent runs a girls’ boarding school. I’d been trying to remember how they ended up keeping Cosette without cloistering her. Though even the schoolgirls follow enough of the rules that it seems like she wouldn’t see Valjean for years, which I don’t recall being the case. I love how, after 20 pages describing this convent, Hugo basically says, “since we’re already off-track, I may as well go off on another tangent.” And this is before the part the translator decided to pull out into an appendix! I didn’t read this chapter the first time through. I can see why Norman Denny pulled it out. (He notes that even Hugo’s editor wanted to remove it, but that Hugo insisted on keeping it.) It’s basically 10 pages of Hugo ranting about convents and monasteries, which he calls “a wasting disease of civilization.” His attitude — and keep in mind that he was very religious, and the beginning of this chapter says that the main character in the book is God — is that the institution was a necessary horror in the middle ages but had no place in the modern world. Interesting thought: a monastery has equality and brotherhood, but not liberty. Hugo takes atheists to task, comparing them to blind men refusing to acknowledge the existence of the sun. He admits that some atheists are great philosophers, though he rejects their philosophy. Nihilists, on the other hand, he has nothing good to say about. He goes on to clarify that he’s in favor of religion in general (which is pretty obvious from the rest of the book)…just not organized religions. According to Wikipedia, his views shifted even further in this direction as he grew older, opposing the Catholic Church in particular (this is France, after all), calling himself a “Freethinker” and espousing essentially Deist views. In related news, the movie is out on Blu-Ray and DVD today. I’m looking forward to seeing it again. I enjoyed it despite its flaws, but a lot of my opinions on it are really still first impressions. I’d like to develop a more considered view of it. Plus of course it’ll be interesting to see it again with the novel (or at least the first third of it) fresh in my mind. Maybe it’ll help distract the part of my brain that kept comparing the stage version I know best with what was on screen. Pages covered: 425-450 and 1202-1213. 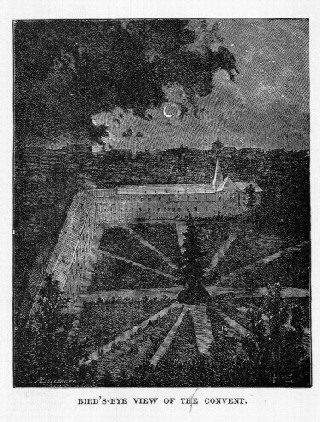 Image of the Petit-Picpus convent from an unidentified edition of Les Misérables, via the Pont-au-Change illustration gallery. Next up: Valjean is buried alive. This entry was posted in Book Commentary and tagged Convent, History, Paris, Religion on March 26, 2013 by Kelson Vibber.